Today, I made a visit to the German Pavilion in Barcelona, Spain, which was designed by Ludwig Mies van der Rohe for the International Exposition in 1929. 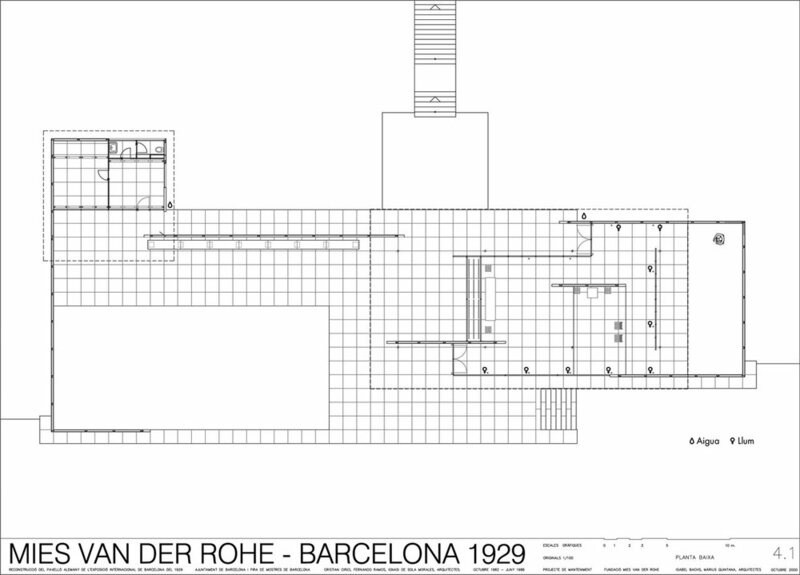 Offered the commission in 1928, Mies created a masterpiece in short order. Built as a temporary structure, it was destroyed in 1930 and rebuilt in 1986. Below is a short introduction to the site as well as a set of photos. As the German contribution to the exposition, it was meant to represent a new, modern, and international Germany -- Weimar Germany. For example, Georg von Schnitzler, who commissioned the project, projected hopefulness in its capacity to represent the postwar nation. The building would give "voice to the spirit of a new era." At the opening of the pavilion, he stated, "We wished here to show what we can do, what we are, how we feel and see today. We do not want anything but clarity, simplicity and honesty." Breaking away from the strictures of traditional architecture and the limits of traditional materials, the building was spatially innovative and technologically revolutionary. A sequence of marble and glass walls, supplemented by chromed columns, support a flat roof, which seems to float above the space. "What would concrete be, what steel, without plate glass? The ability of both to transform space would be limited, even lost altogether; it would remain only a vague promise. Only a glass skin and glass walls can reveal the simple structural form of the skeletal fame and ensure its architectonic possibilities. And this is true not only of large utilitarian buildings. To be sure, it was with them that a line of development based on function and necessity began that needs no further justification; it will not end there, however, but will find its fulfillment in the realm of residential building. Only here, in a field offering greater freedom, one not bound by narrower objectives, and the architectural elements forming the basis for a new art of building. They permit us a degree of freedom in the creation of space that we will no longer deny ourselves. Only now can we give shape to space, open it, and link it to the landscape. It now becomes clear once more just what walls and openings are, and floors and ceilings. Simplicity of construction, clarity of tectonic means, and purity of materials have about them the glow of pristine beauty."